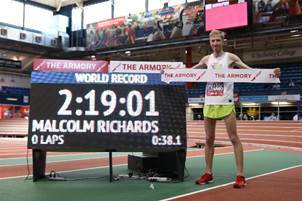 NEW YORK, April 11, 2019 – Three times during the last three years both men and women’s world indoor marathon records were broken at The Armory’s New Balance Track & Field Center. This Saturday, six men, including defending champion Malcolm Richards of San Francisco, and two women will attempt to continue the streak during the Columbia University Irving Medical Center & NewYork-Presbyterian Indoor Marathon presented by New York Road Runners at The Armory in Washington Heights. 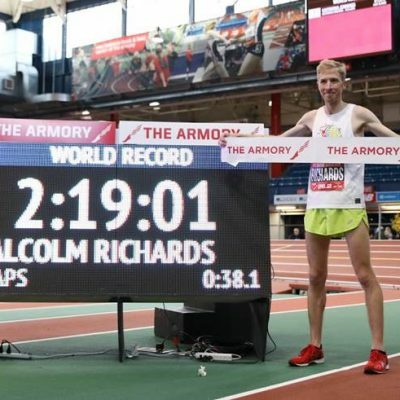 Richards, who won the inaugural indoor marathon at The Armory in 2016, reclaimed his title and world record last year with a time of 2:19:01 covering 211 laps around the Fastest Track in the World. 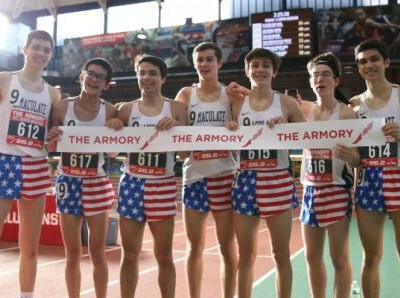 · Chris Zablocki, the 2017 indoor marathon champion at The Armory (2:21:47). A graduate of Dartmouth and a doctor who recently accepted his medical residency in Phoenix, Zablocki was featured in a New York Times article where he was labeled the “Best Extreme Marathoner.” Zablocki competed in 13 marathons in 13 months prior to running in the 2016 Olympic Trials. · Husband and wife duo, CJ and Chelsey Albertson. CJ, who is currently the cross-country coach at Clovis Community College in Fresno, Calif, made his marathon debut this past November and ran a 2:17.40 to win the Two Cities Marathon in Fresno. CJ was an Academic All-American while running at Arizona State. Chelsey also ran at Arizona State where she met CJ. Chelsey was the team captain at ASU and was ranked 17th and 22nd in the nation in the 5,000m and 1,500m respectively. Her 1,500m time is second in school history, only behind Olympian Shelby Houlihan. 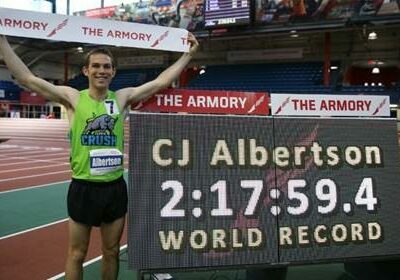 CJ and Chelsey have an opportunity to be the first husband and wife team to bring home two indoor marathon world records at The Armory at the same time. · Andrew Lemoncello, who competed in both the 2008 Olympics and 2005 and 2007 World Championships for Great Britain. During a 2010 marathon in London, he turned in a personal best performance of 2:13:40. A resident of Oregon, Lemoncello was an All-American in both cross-country and steeplechase for Florida State University. 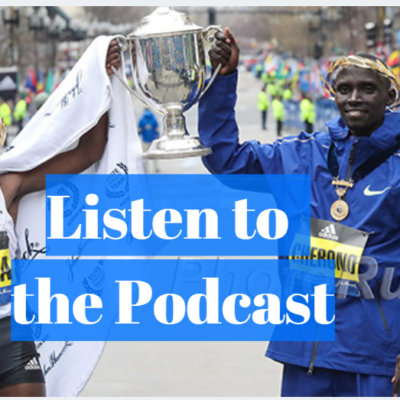 · Jonathan Kotter, a lawyer from Salt Lake City who ran at Brigham Young University and owns a personal marathon best of 2:19.23. · Alex Ekesa, the first Kenyan to run in the indoor marathon at The Armory. His personal best is 2:28:45 and came in 2018 in Kenya’s capital, Nairobi. · Stephanie Pezzullo, who will be joining Chelsey Albertson in their chase to break the women’s world indoor mark of 2:40:55, set one year ago at The Armory by Lindsey Scherf. Pezzullo owns a personal best of 2:32:42 and currently coaches runners and triathletes in central Florida. She started her running career after playing soccer collegiately at Penn State. The men and women’s World Record Challenge begins at noon on Saturday. Both overall winners will receive $3,000 in prize money, with another $4,000 available as a bonus for a new world record. The team relay portion of the event, to take place Friday-Sunday (April 12-14), allows groups of up to eight friends, family members or co-workers to tackle the distance as a group, making this race accessible to all. There are 101 teams entered this week to compete in the relay portion. Proceeds from the event benefit the non-profit Armory Foundation and Armory College Prep, which sends nearly 100 percent of its New York City high school students to four-year colleges and universities. Other sponsors of the Columbia & NewYork-Presbyterian Indoor Marathon include: New York Road Runners, Skadden, AB, Debevoise & Plimpton, Scopia Capital Management, Cravath, The Wright Group NY, Acadia Realty Trust and Sterling Affair. For further information go to www.indoormarathon.org.